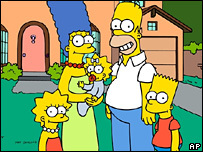 Animated comedy The Simpsons has won one of US TV's most prestigious awards for the ninth time. The series won the Emmy for the best animated programme at a ceremony in Los Angeles. It beat a controversial episode of South Park which lampooned the Church of Scientology and actor Tom Cruise, one of its most famous followers. The prize was handed out at the creative arts Emmy awards, which precede next week's main ceremony. In his acceptance speech, Simpsons executive producer Al Jean joked: "This is what happens when you don't mock Scientology." The series - which has now been on the air for 17 years - won the best animated programme prize for shows lasting less than half-an-hour for an episode called The Seemingly Never-ending Story. The awards largely honour technical achievements in television, with Elizabeth I - a co-production for the HBO network and the UK's Channel 4 - winning five awards. Actors Leslie Jordan and Christian Clemenson both took prizes for their guest roles in Will & Grace and Boston Legal, while Chloris Leachman and Patricia Clarkson took awards for their parts in Malcolm in the Middle and Six Feet Under. The main Primetime Emmys ceremony will be hosted by talk show host Conan O'Brien, and held on 27 August.